Talon graduated from the University of Regina with a Bachelor of Business Administration in 2013, with a major in Human Resources. In 2015, he graduated from the University of Saskatchewan with a Juris Doctor and moved to Moose Jaw before being called to the Bar in 2016. He is currently serving as President of the Moose Jaw Bar Association. Talon has done extensive volunteer work, including work with Pro Bono Law Saskatchewan and the Saskatchewan Human Rights Commission. During law school, he was the president of the Corporate Law Club, treasurer of Green Legal, and an award-winning participant of the 2015 ICC International Commercial Mediation Competition in Paris, France. Talon is a published author. He has written articles for the Leader Post in Regina and various magazines, including a three part series titled Sociopathy in the Legal Profession for The Saskatchewan Advocate. 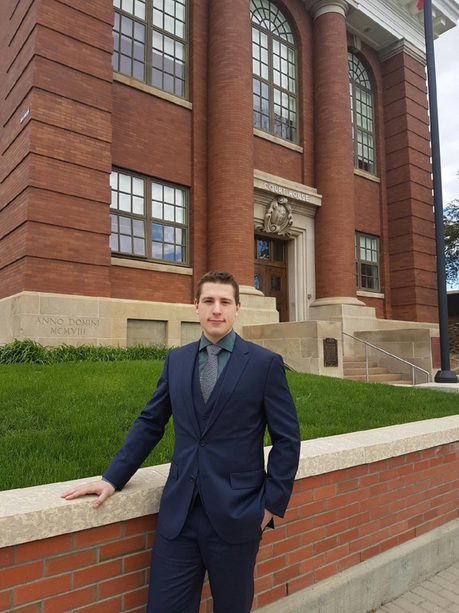 To enhance his legal career, Talon is also developing a Virtual Reality Trial Simulator to help both lawyers and the public develop the knowledge and skills necessary to conduct a trial. Talon has experience at all levels of court in Saskatchewan, having run criminal trials in Provincial Court, resolving family disputes in Queen's Bench, and litigating at the Court of Appeal on municipal and administrative law. He focuses on courtroom advocacy and dispute resolution, but operates a general practice that also involves matters from Wills & Estates to Corporate/Commercial. Talon has been recognized as an excellent businessman by the Moose Jaw Chamber of Commerce as a finalist in the Moose Jaw Business Excellence Award category for Young Entrepreneur in 2017 and a finalist in the category for Business Innovation in 2018. Each year, Lexpert Magazine releases a list of Rising Stars honouring Canada's leading lawyers under 40. Talon Regent was a finalist for 2016/2017 and was titled one of Canada's 'Lawyers to Watch'! In 2018, Talon won Lawyer of the Year in the category of Alternative Dispute Resolution by Finance Monthly. Outside the courtroom, Talon is active in the community. He is a member of the Moose Jaw Elks and a Chairman of the Judiciary for the Saskatchewan Elks Association where he contributes his time and expertise to help raise funds for various charitable causes. He also contributes his time and expertise by providing free legal services to low-income individuals as an agent of Legal Aid and a volunteer with Pro Bono Law Saskatchewan. Socially minded and politically active, Talon is an Executive Officer of the federal NDP's Sask Council of Electoral District Associations.